Over the past week or so I’ve begun to make my own baby food. I’ve been steaming and pureeing apples, pears, broccoli, sweet potatoes and squash and placed them in ice trays to freeze. Parker hasn’t tried any of that yet, but we did give him a little soupy mixture of brown rice cereal and breast milk for the very first time today. Let the food exploration begin! I’m excited to see what new foods he’ll enjoy and what new faces he’ll make during this new adventure. Ahhh, those adorable faces! I love it! That was great!! And his reaction is completely normal. 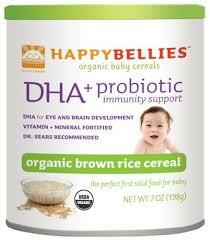 We love Happy Bellies, they have a great line of frozen baby foods, it was the only thing Marcello ate.